Okay, this was supposed to be easy. 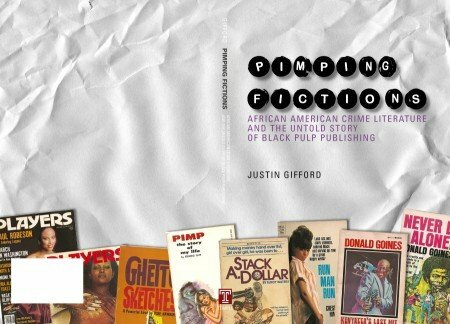 Once I received the manuscript for the cover design, my mind started to rattle off several references that would work well to express the title at hand: “Pimping Fictions”. It wasn’t long before the other shoe dropped. The editor felt it was very important to show covers of the books talked about in the text. Kinda makes sense, but it wasn’t going to be easy. These are pulp novels written mostly in the 70’s by black fiction writers. Very lusty material. However, showing all of the covers in a scattered fashion while still trying to unify the look and tone of the title promised to be messy. In my first sketches, I thought it might be best to contain the art of the various covers at the bottom of the trim, and wrap them from front to back. Of course, this creates loads of visual voices, so I thought it might be best to avoid color elsewhere. I also like that the greyscale type and art give it the dignified look of a retrospective, assuming retrospectives are in fact dignified. Still a fun title.